ENERGY SAVER: Automatically powers down after 15 minutes of idling indicated by the Pause LED-saving power while extending tip life. 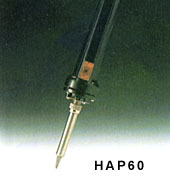 DELAYED SUCTION: Pump will continue sucking for 1-2 seconds after actuator is released, clears the tubes and prevents clogging of the tip. DIGITAL DISPLAY: Temperature Set/Read is made easy! Zero Voltage switching and fully grounded design makes this unit safe on electro-sensitive devices. Adjustable Temperature w/o changing tips. 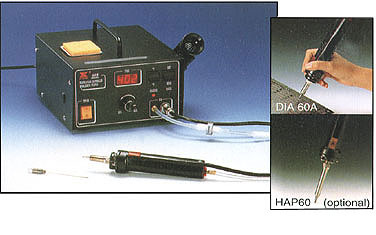 Suction is controlled by a finger actuated thyristor circuit located fro ease of operation on the desoldering handle. A self-contained diaphragm vacuum pump engineered to provide continuous, maintenance free operation. Powered by a high quality 24Va.c. transformer.